The Danish Design 2 In 1 Dog Coat is the first convertible for dogs! With it's removable polar fleece liner, this coat is superb for both the winter and warmer months. For winter warmth, attach the polar fleece liner to the coat with the easifit velcro strips. When it's warmer, remove the fleece and the coat converts to a light raincoat. The coat also features full chest protection, light reflective beading and light reflective fastening strap for extra safety at night. Rear leg straps are also built in to help prevent side slippage. 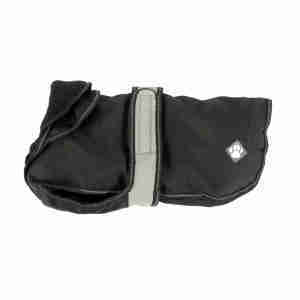 The outer coat is made from a waterproof, windproof and breathable fabric to protect from the elements and ensures that your dog is comfortable whatever the weather. To accurately measure your dog for a coat, measure from between the shoulder blades to the base of the tail. Choose the size closest to that measure for a comfortable fit. Measure from between the shoulder blades to the base of the tail to get the correct size. Bought the 20" for my Whippet. Fits perfectly in all areas. Very well made & will keep him snug this winter. Also like the fact i can remove the fleece inner & he can wear as a rain coat too. Great value for the money. Really lovely fit, size 16" fitted my Scottish Terrier perfectly with plenty of wriggle room. Fits right underneath front legs up and round so doesn't slip when they are running around. Really good value for money, very happy with them. Danish design 2way dog coat. Lovely warm coat and fits really well..bonus of free delivery too. Generous size. Easy to put on. Versatile, can use in warm or cold weather. Reasonably priced.